Target is resetting its marketing strategy to actively seek “brave love with mass reach” and it’s going to use customer insights and digital to achieve it, CEO, Guy Russo says. Speaking at a strategic presentation day held by ASX-listed parent company, Wesfarmers, Russo told investors it’s been 12 months of change as the embattled retail group strives to reset its business and reclaim its tagline of delivering quality fashion and basics at low prices. Russo outlined Target’s turnaround in three phases: To fix underlying supply, cost and structural challenges; to reset the business, and then to grow. Driving this is a strategic framework focused on product, price, promotion, customer, place and people, all centred around profit. “Over the first 100 days we have reset the vision, values and strategy of Target,” Russo said. “Our vision is simple: To deliver quality fashion and basics to everyone at low prices. In terms of promotion, the ambition is “brand love with mass reach”, Russo said, and Target is developing better customer insights as well as a more holistic approach to customer engagement as key elements of this strategy. He played Target’s most recent TVCs for Easter and Winter to illustrate the new messaging. “We have reset our marketing spend, including evaluation of all mediums we use,” Russo continued. “We’re focused on developing customer insights to lead our culture so over time, our buying and merchandisers include marketing, use proper disciplines as we bring products in our stores. 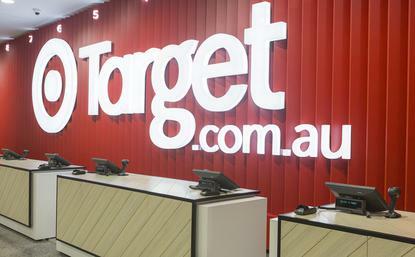 Online is an obvious contributor to this, and Russo said Target had spent the past 12 months working to improve its digital offering by exiting unprofitable lines and establishing a more commercially viable online range, improving its click-and-collect offer, and focusing on more convenient customer experiences. At present, just 3 per cent of total sales are coming through the website, Russo said. But he noted customers who use click-and-collect online are on average spending three times the amount pure in-store shoppers do. As well as extending availability of click-and-collect, Russo is also looking to introduce real-time inventory availability and further increase online’s role in driving traffic to stores. Alongside online, it’s vital Target provides the easiest and most enjoyable customer experience in-store, and Russo highlighted improved presentation of stores, a reduction of point-of-sale to simplify store operating environment, improved customer navigation, and training around better customer service as key investments in recent months. Russo, who was Kmart’s managing director from 2008, took over as Target chief last year as part of a restructure of Wesfarmers that saw Kmart and Target united around one department store division. As part of the changes, Kmart chief operating officer, Ian Bailey, was appointed Kmart managing director.